The Democratic People’s Republic of North Korea today threatened New Zealand with a nuclear attack in response to new sanctions leveled on it by the United Nations. The isolated communist dictatorship had earlier made a similar threat against the United States, but retracted it following President Obama’s swift assurance that any ballistic missile attack against his country could be quickly and easily intercepted. Acknowledging that its initial proclamations were overzealous and unrealistic, the DPRK today reissued its threats, this time against several more vulnerable countries, including Turkmenistan, Iceland and New Zealand. Speaking from Chile, Prime Minister John Key told a pool of reporters that nothing could be done to stop the attack. 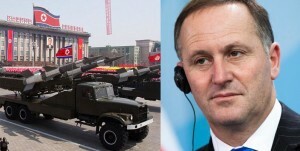 “Well, you know, if they want to, what do you want me to do?” asked Key, noting that New Zealand did not possess the sort of anti-missile defense systems available to countries like the United States. “Does the government have a contingency plan if such an attack occurs?” asked another. “No” said Key. While the government appeared disinterested in doing anything about the nuclear strike, there were some promising indications of external aid from abroad. Tonga’s Prime Minister, Sialeʻataongo Tuʻivakanō, promised that he would “look out for any missiles”, and Prime Minister of Australia Julia Gillard phoned Bill English last night to assure him that, in the event of a nuclear attack, Australia would do everything it could to provide additional news coverage.